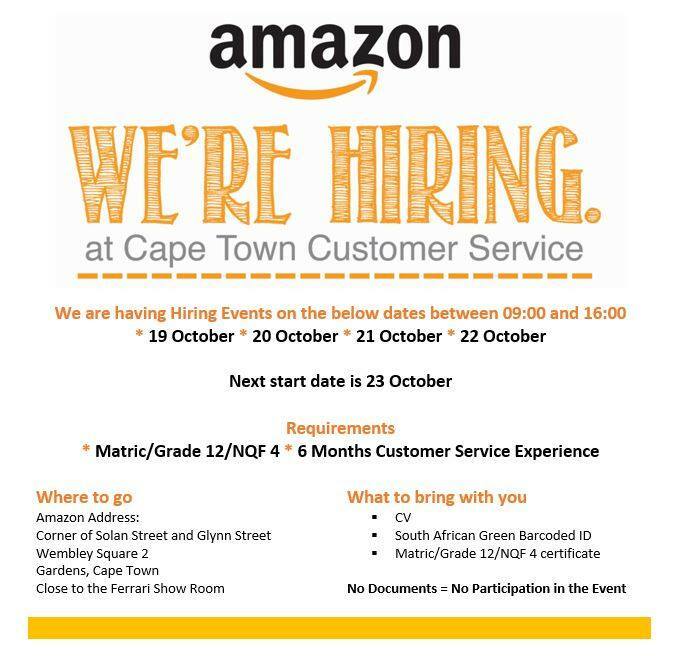 Amazon South Africa is seeking bright, articulate, detail-oriented applicants with a desire to contribute to world class customer service to join them in a seasonal/short term position as a Customer Service Associate. These positions are based in Cape Town. As a Seasonal Amazon Customer Service Associate is a critical part of our mission to deliver timely, accurate and professional customer service to all Amazon customers. This vital position requires an action-orientated, flexible problem-solver who will assist customers in resolving any and all customer facing problems. Associates may communicate with customers via phone, email and chat. Associates will utilize a variety of software tools to navigate customer accounts, research and review policies and communicate effective solutions in a fun, and fast paced environment. Send your names and contact details to cs-cpt-hvh@amazon.com to attend an Amazon hiring event. Please note that you will not be able to access the building unless you have RSVP’d to the email address listed above.